Not a day goes by where there isn’t some news about near field communication and mobile payments. People are expecting big things from Google Wallet and ISIS, but with limited rollouts and handsets NFC simply isn’t available to most of us. 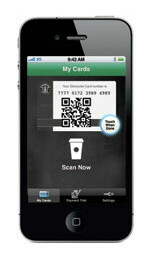 Contrast that with the Starbucks Mobile Card application for iOS, Android and Blackberry. Since Sept. 2009, smart phone users have been able to download the app, load a prepaid card and then use the handset to make purchases at Starbucks. In addition to payment, it also tracks the customer loyalty program, basically a high-tech punch card that rewards caffeine junkies for frequent purchases. Customers activate the application when they’re in line. A bar code appears on the handset’s screen, and the user scans that into the point of sale device. The purchase is deducted from the stored value account and a credit is given to the loyalty program. In the store the app works very well. Just hold your phone’s screen to the scanner and wait for the beep. The application seems to be popular, at least according to my local Starbucks’ barista. He tells me that about a third of the store’s customers use the application. These applications are a way for retailers to offer new payment types without having to deploy any new point-of-sale infrastructure. Starbucks already had bar code scanners in place. And because the app uses the company’s existing stored value card as the payment account, they reuse that infrastructure and earn money on the float (not the float atop the cappuccino but the unspent value sitting in all those accounts). Starbucks also saves money on payment card transaction fees. Instead of having to pay interchange on every $4 coffee purchased, Starbucks only pays when the card is reloaded. Some payment card analysts suggest these types of payment applications may win the mobile payment battle, as merchants prefer them because they don’t have to invest in new infrastructure. Personally, I’m not so sure. I don’t know if I want a separate app for each of the stores I frequently visit. As for the Starbucks app, it’s easy to use but signing up for it and figuring out registration and reloading wasn’t as easy or intuitive as I would have liked. First you have to go to Starbucks.com to create an account, that part is easy enough despite the fact that they want a minimum six-character password with a capitalized letter and a number–tough enough to rekey at the desktop but ultra challenging on a smart phone. 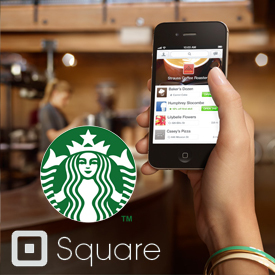 But in order to set up the mobile app I had to have a Starbucks stored value card. I couldn’t just set up the app and use my debit card to fund it. Since I didn’t have a Starbucks stored value card, I had to send myself an online, virtual card. After waiting for that email to arrive I clicked on the link to have it associated with my mobile app. All these steps to get registered were frustrating. For my first use of the app, I was purchased some coffee beans as well as a drink, which just about wiped out the $20 in funds I had loaded. I couldn’t figure out how to do a reload from the mobile app so I had to wait until I got home to search Starbucks.com. This should be available on the mobile app. I suspect they opted against it to deter fraud, but it sure would be convenient. For other retailers considering this type of app, please make sure the registration process is simple and don’t challenge me to reload my account. Even with these assurances, however, I doubt I’d go through such involved steps again for a payment application that I can only use at a single merchant.